I hope you are all well and had a good summer. I’m attaching a proposal for a live music event in Dalston Square on 12 October, as part of Hackney’s Black History Month celebrations. The proposal is being made by Hackney’s library service and a representative of the service will meet with us before the event to talk through their plans. As soon as I have been able to set a date for that meeting I will be back in touch. In the meantime, if you have any comments, suggestions or concerns about the proposal, please do get in touch with me. After 7 very productive years, the current Chairperson of the ‘Buildings Committee’ is stepping down. The DSRA is now looking for new members and someone to take on the role of chairperson. The group meets every 3 months with First Port management to go through issues related to the day to day running of our estate. If you are interested in helping out, but perhaps do not feel ready to take on responsibility for chairing a group, please nevertheless contact us. We are always looking for fresh members for the committee. A friendly welcome is guaranteed! Contact us via the DSRA letter box Gaumont Tower Lobby or the Site Management Office. The Residents Association set up a ‘Buildings’committee from the first days of the complex opening. The committee works closely with FirstPort to ensure our buildings are well maintained. The ‘Buildings Committee’ meets four times a year. Face to face with First Port regional and local managers. A resident always chairs the meetings. Our aim is to ensure that our buildings, and all common areas, (lobbies, stairwells, corridors, roof terraces, garages, lifts etc) are kept in good order. The committee also considers the longer term upkeep of the buildings. We get sight of FirstPort’s budget and their Asset Management Plan to help ensure proper measures are taken to buffer against future large item expenditures. While FirstPort deal with day to day maintenance issues as they arise, the committee maintains its own ‘Repair and Maintenance Log’ of items raised by residents. We check on progress at each meeting. Any resident can attend this meeting or add an item to the Log. The minutes of the last meeting are available in hard copy for residents only. They can be obtained from the Site Manager’s office in Gaumont Tower, during office hours. Ask the concierge desk for directions or contact Gerald Bernard the Site Manager directly if you want a copy. Future meetings and agendas will be advertised on this site. Next meeting is scheduled for June the 8th 10 am. All residents are welcome to attend. Please contact First Port offices to express interest. Cultural events in the Square? Have you ever felt that the Square could be enlivened? Do you want to help create a sense of community? A sense of things going on in the Square on those warm summer days? Lucy McMenemy the energetic Hackney Arts and Culture coordinator and driver is keen to hear from residents in the Square. Join in and make yourself heard! Yes there seems to be a problem with many of TP24 long-necked bulbs set up in ceiling of Kitchen areas blowing inside of a year of their installation. While followup this up I contacted the people who sell the TP24 yesterday ( http://www.tp24.com/shop/all-products/lamps-bulbs) for some replacement bulbs ( 3 5.50 each) and they told me to guarantee them into the future, to ‘register’ my fresh purchase of the what they call the ‘replacement bulb’ ( see ref number below) which will guarantee them for 2 years. .
For those residents who are still within the five-year life span guarantee for their flat. It would be worth contacting Barratt Homes customer service to see if you can claim the cost of the bulbs from them. The new restaurant is now open. Residents will have mixed views about this new complement to the Square. Some are concerned about the noise disturbance that Turtle Bay’s ‘beach party’ pitch might cause to the peace of the Square. Others are however looking forward to a piece of ‘Caribbean spirit’ adding warmth and sunshine to Dalston. Only time will judge how things will work out. The restaurant has however made a rather ‘mixed’ start! Weary of the potential problems of more kitchen smoke entering the buildings immediately above, a small group of DSRA members were invited last week to look around Turtle Bay’s smoke extraction and filtration system. Billed as a ‘state of the art’ set up, it all certainly looked impressive! We will see if this ‘eco filter’ stands up to heavy use in the weeks ahead! Those residents whose windows and balconies overlook the Square sadly took the full impact of Turtle Bay’s boisterous first-night event last week. A live Band struck up which could be heard from all corners of the Square. Added to this was some energetic behaviour which as the evening wore on, spilt out onto the Square while residents were settling down for the night. The reports of disturbance were considerable and the concierge service was overwhelmed with calls. Their team tried to intervene but from all reports the managers were less than cooperative. It should be said that the band did stop at 11pm but it was again frustrating that the roadies took their time to pack up and the disturbance did not finally abate until after 1. 30 am. Don’t be a kill joy? Everyone enjoys a party once in a while. However loud music late at night is nearly always a source of ill feeling for neighbours living in a block of flats. It should be pointed out that our leases state that noise should not be so loud as to be heard beyond the four walls of our homes. The good news is that we have received fewer complaints about noise in recent months. In the case of Turtle Bay’s party an effort by the managers to forewarn its many neighbours would have made a difference while also conveying a degree of community spirit too. The DSRA met with the management the next day. It was told that the event was a ‘one off’ and should not happen again. Sadly, we did not get an apology however. Residents who feel strongly should ‘log’ their complaint on the Council’s online noise pollution page. Restaurant Smoke- Gaumont Tower and the Gym. The smoke emanating from the restaurant kitchens beneath Gaumont Tower continues despite the efforts by the DSRA to get Le Ziz to service and repair its kitchen filters. The situation in the gym has nevertheless, improved as Barratts have headed The DSRA’s request to install new inward ducting to bing in fresh air from outside the building. This seems to have worked. The service tunnel behind the restaurant however is still filling with smoke at peak cooking times and we continue to campaign for proper extraction ducting to be retro fitted by Barratt Homes to take the odours and smoke away. Barratts have consented that this is needed but are awaiting planning consent from the Council. We have engaged the support of Councillor Peter Snell to help chase this matter up at the ‘highest level’ in the Council. He has done so but progress is slow. We understand, legal measures are to be taken to impose lease agreements on Le Ziz. We ask residents to keep up the pressure on the smoke pollution by notifying the Council again via their online pollution page. Things are of course by no means all gloomy. The DSRA can claim a long list of achievements and improvements since the Square opened. As always our work requires activists and so we are always looking for new residents willing to join us in whatever capacity. 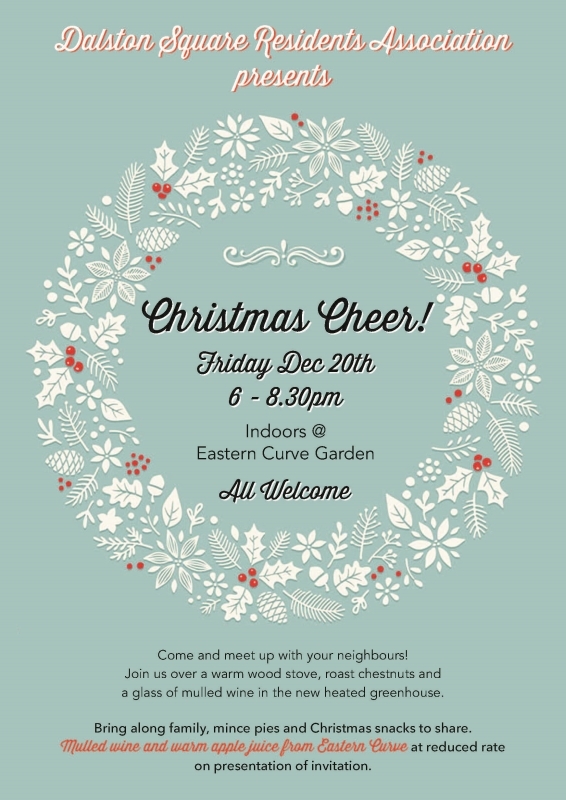 If you are Interested and want to meet engaging and interesting neighbours, we would love to hear from you! Contact the Residents Association at dalston.square.com and we will get back. 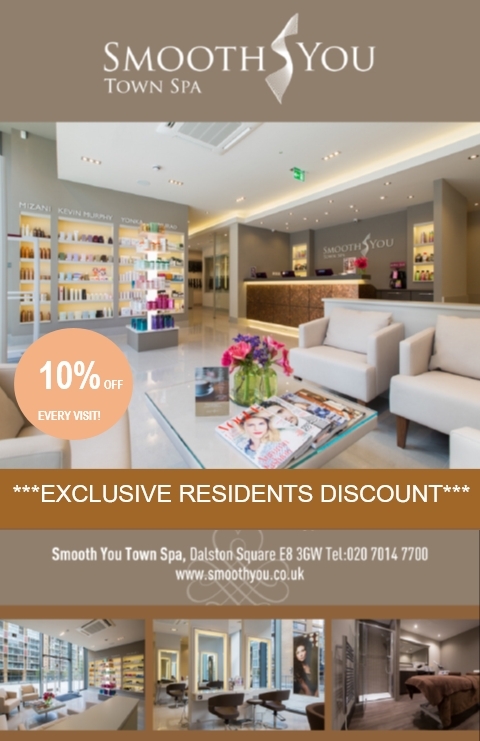 Now firmly established and in their second year of trading here in the square since their move from Islington, Smooth You have been in touch with a great offer for all Dalston Square residents: A 10% discount on all of their services and treatments until further notice. With experienced staff and the newest equipment (though no expert when it comes to beauty related equipment, the manager invited me for a quick tour and I was amazed at the quality and class of their facilities), more than just hairdressing they offer just about every service and treatment there is to help you look and feel your best. Check out their website or pop in to discover the full extent of what they have on offer. Click the first of the thumbnails below to see the poster they have produced to advertise this residents’ only deal. Further to my previous post regarding the Dalston Ward Forum meeting, DS resident Kim attended and has written a report on the topics discussed. With some 30 attendees it seems conversation was lively and informed. Apparently notes were taken and minutes will be produced and sent out when complete, but in the meantime Kim’s report can be found over at our discussion forum HERE. A big thanks to Kim for taking the time to write this up for us. I will share the official minutes with everyone when and if I can lay my hands on a copy. Back on April 1st, representing the DSRA I attended a meeting of Hackney Council’s ‘Dalston Square Culture and Community Engagement Forum’. At the meeting we were presented with 3 proposals Hackney Council have received to stage public events in Dalston Square. All 3 proposals were welcomed by all those present, although some clarification was needed on the details of a ‘World Food Market’, offering an artisan market in conjunction with a hot food court, to be run over the course of a 3 day weekend in May. Proposed by Lambeth Smith Hampton (the company that owns and manages the commercial properties in the square) and organised by Epicurean Events Ltd., it is hoped the food festival will be both of interest to the local community and an attraction to people from other areas of London. If successful, this could become a regular (monthly?) event. I will keep you all abreast of developments of this proposal. The second, confirmed, proposal is a project entitled ‘Super Dads’, set to run during the first 4 Saturdays in August (the 1st, 8th, 15th, and 22nd) from 2pm to 4pm. Run by Universal Board Games, the events will be open to all families living in Hackney, and are aimed at encouraging families to enjoy time playing games together while boosting literacy and numeracy in a fun, low-cost manner. Although aimed at promoting the relationship between fathers and their children, all members of the family are invited and welcome to participate. As well as traditional favourites such as chess, backgammon, and dominoes, less well known games, such as Mancala from Ghana, Crokinole from Canada, Go from Japan, Carrom from India, as well as many more games from around the world, will be available to reflect the cultural diversity of the area. The third and final proposal will be launch event of……. Scheduled for Saturday 2nd May, from 8pm to 10.30pm, organised by Hackney Council itself (a library initiative), there will be a public film screening in the square. 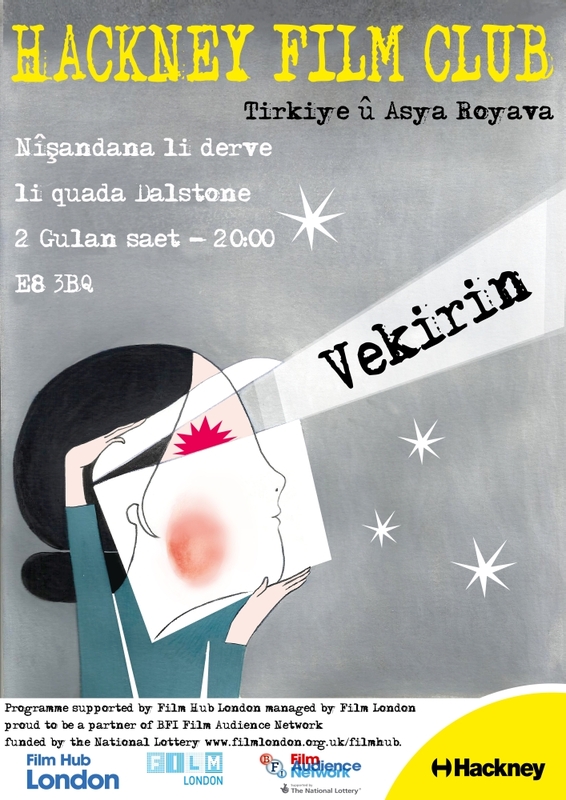 This will be a screening of the film ‘Bana Masal Anlatma‘ (‘Don’t Tell Me Tales’), a Turkish film with English subtitles, rated 12A (this movie receives an impressive score of 8.2/10 on IMDb.com). This launch will be followed by further screenings of films from Turkey and East Asia inside the C.L.R. James Library on the first Thursday of each month. There will also be further film screenings at both the Rio Cinema and the Hackney Playhouse. Details of all film screenings will be publicised in the C.L.R. James Library. Below you can see their event posters in English (the 2nd thumbnail), Turkish (the 3rd) and Kurdish (the 4th). Just a quick post to say your Dalston Square resident only special offer from Mussel Men can now be found in your post-box. If you decide to take it up (and I highly recommend you do), do not forget to take the card with you: You will not get the deal without it. One last thing before I sign off: In the process of posting these cards into everyone’s post boxes, I tail-gated into 4 blocks within the square, and encountered residents in 4 further lobbies. Not a single person questioned me as to what I was doing. For your own security, as well as that of your neighbours, please question apparent post-box spammers, and ensure those attempting to tail-gate you in have an entry fob of their own. If they do not have one, ask them to leave: If they refuse, report the issue to the concierge. Foyer entrance doors are the front line of your security. 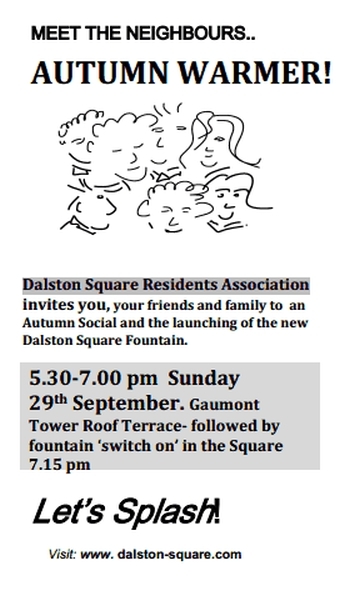 Hello residents and neighbours of Dalston Square, time to bring you up to date with all that is happening in and around the Square. There is though quite a bit to say so I am going to break it down into a few posts over the next few days to avoid boring you all with an info-overload. For today then, 3 very important things to tell you about. Firstly, one for all of you who own or rent a parking space below phase 1. I have just posted the latest Residents’ Alert from Consort to our Forum which gives notice that new parking permits are currently being issued to replace the existing ones. If you have such a permit, read the alert HERE. Secondly, the latest news regarding Telford Homes planned redevelopment of Holy Trinity School at the south-east corner of the Square. Most of you will already know that Hackney Council rejected the plans on many grounds including problems with the design, it’s contravening the council’s own DAAP, and it’s impact on local residents (both in the Square and outside). What you may not all know is that the developers then went over the council’s head and directly approached the offices of London Mayor Boris Johnson, the GLA, who have the power to overrule Hackney Council. The GLA are currently looking to do just that, on the grounds of needing the extra school places, but before giving the final go-ahead will be holding a public Representation Hearing (date to be announced but expected to be before the end of the year). In the meantime however, the next Hackney Council Dalston Ward Forum meeting will be held in the CLR James Library on Monday 7th October between 7pm and 9pm, where this topic will be further discussed. When I have more info on the GLA Representation Hearing I will of course let you all know. Lastly, and probably most importantly 😉 it is time for the DSRA Autumn get-together. Posters are being produced for each blocks’ notice-board, and flyers are on the way to residents’ mail-boxes, but here are the details so you can plan ahead. Click into the thumbnail image below to see it full size. That’s it for now folks, but I will be posting again very soon with news of what the DSRA have been up to, on your behalf, over the summer months.